The thrust of this curriculum is to immediately, enrapture, enthrall and engage the participant adult family members in the ease with which they can become active readers to and with their children and neighborhood youth. Beyond that explicit family literacy goal, the aim of this experience is to enroll the participants into the circle of active readers and writers. 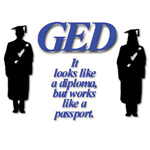 This course is designed to enable, inform, empower, and inculcate participants in the independent use of educationally credible internet resources as GED and job skills learning tools. Beyond accessing and mentoring the participants as they navigate and prepare for the GED test success through use of the sites in a targeted content and skills development sequence, the course engages participants in working in small study groups to design their own online/print news based versions of the GED Test. This task, which also involves their maintaining individual Microsoft word file GED Prep Tech Ticket to Pass Dictionaries of key Test Words and GED Prep Tech Site Guide to Success Tips, works to transform the participants as the course progresses, from anxious test takers to engaged, electronically literate and competent, test makers. In the process, they hone their GED skills through instructor mediated use of these online resources. They develop online internet research and workplace teaming skills that will make them capable lifelong technology users and producers.